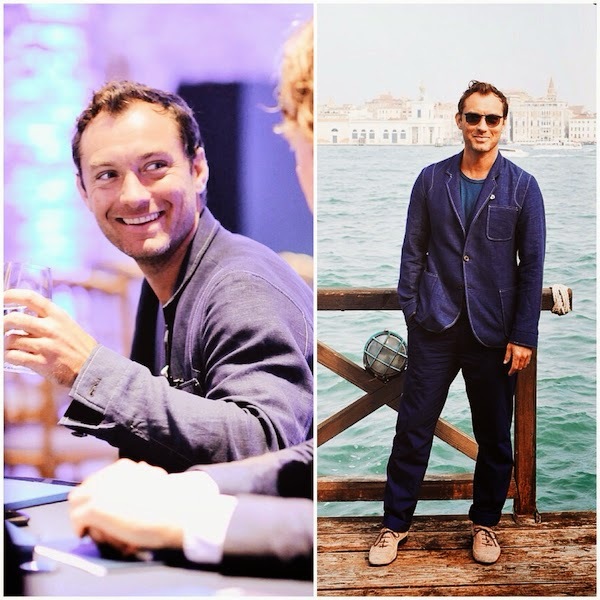 Jude Law attended the screening of the Johnnie Walker Blue Label short film, The Gentleman’s Wager at the Cipriani Hotel during Venice Film Festival on 27th August 2014 in Venice, Italy. Jude Law looked really good in an Oliver Spencer blue cotton blazer when he attended the photocall by the scenic Venice River. "The Gentleman’s Wager" is a 6 minutes short feature from British director Jake Scott, and features Jude Law and Giancarlo Giannini. It tells the story of a wager between two men striving for personal progress through the quest for a truly rare experience. Jude Law takes on the role of a man who, despite having it all, challenges himself to strive for something he wants that money can’t buy. Call it a long Johnnie Walker commercial or a short feature film, Jude Law is one very captivating and charismatic performer. Still one of my favourite actors to date. And oh, very loving Giancarlo Giannini's sunglasses on the boat.